Request Ad's is something that shows up every <insert time here> on a channel, or when somebody types !request. You usually put whatever you want somebody to send you in here. But some people use it just because it pops something up every once in a while to tell people in the channel something. 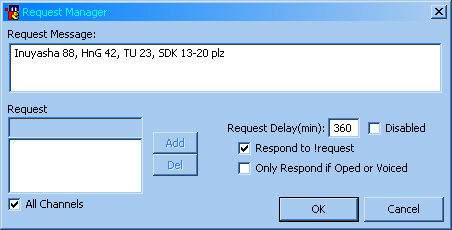 To set up your own Request Ad in SysReset, open the SysReset menu and select "Request Manager". The Request Manager menu pops up. Put the message you want to use inside "Request Message:". Then, choose whether you want it to show itself automatically, or to respond to !request, or both. 360 is a reasonable delay, but you can choose whatever you want. Responding only when opped or voiced isn't very useful, but use it if the channel has that rule. You may set the channels to display the ad in, or if you want set it to "All Channels". If some channels don't let you use a request ad, then uncheck it and add the ones that do. Once all is configured, click OK. To show the ad manually, right click channel, and select "Request [all chans]". To preview your ad, use simulate Advertise. Nick alert in mIRC: Go to options -> IRC -> Highlight. You can add words that will activate a sound/flash the window/highlight the message when someone says them. If it doesn't work as well as you feel it should, try looking into nick alert scripts. All content on this site is written by Kirika. Please link to this site if you use any of its content.